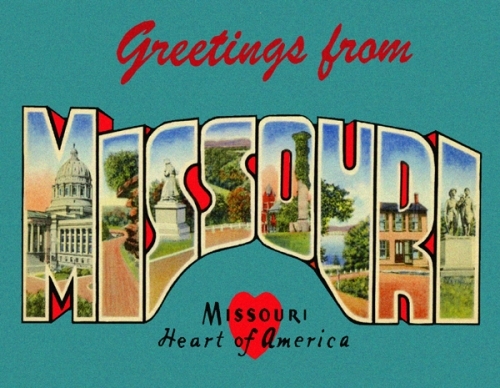 Greetings From Missouri Custom Postcard - Custom original only available at Legends General Store. Text on back: Greetings From Missouri. The "Show Me State" offers stunning scenery in its rolling hills, winding rivers, and limestone bluffs. Explore its many underground caves, enjoy its white water rapids, fish in its numerous streams and lakes, and take a drive down historic Route 66. Postcard is brand new and in mint condition.